You can change overnight (you can't change overnight) by US artist Bryan Graf (b. 1982) is on display at the Prismatic Tracks exhibition at Yancey Richardson Gallery, New York (23 October - 6 December 2014). Graf's practice explores the tension between control and chance. His optical research into kinetic photograms focuses on light, mesh screen and photosensitive paper. 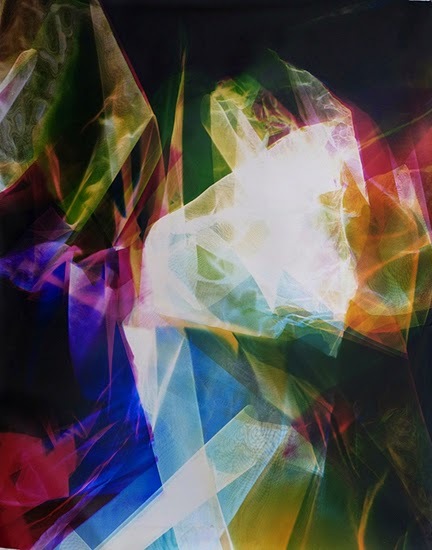 Light is exposed onto paper from various angles, resulting in colourful and intricate forms. Bryan Graf, You can change overnight (you can't change overnight), 2014, 64.25 x 50 inch chromogenic print, from the series Lattice (Ambient), unique. Courtesy of Yancey Richardson Gallery and the artist.